AT&T, a major sponsor of the NCAA tournament, has released a series of new March Madness-themed commercials, highlighting that the company is “America’s best wireless network” and that it now offers its customers 5G Evolution, the first step to 5G. 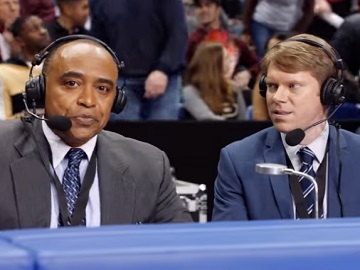 All of the ads, from creative agency BBDO, feature an announcing duo played by Mark Neely and Tim Baltz and are aimed at emphasizing that “Just OK is not OK, whether it’s announcers or wireless networks”. In one of the spots, Neely’s character, Ken, asks his colleague, Phil, for insight into his time as a player. The latter, misunderstanding the question, answers that those stories would not be appropriate because he’s now happily married. When Ken specifies that he was referring to Phil’s days as a basketball player, Phil has an unexpected reaction: “Oh, heaven’s, why? Those are boring,” he says. At the end of the commercial, the voiceover (Lena Waithe) says “Just OK is not OK, whether it’s announcers or wireless networks” and adds that AT&T is “America’s best wireless network according to America’s biggest test, now with 5G Evolution, the first step to 5G”. A final onscreen line also informs that AT&T is a proud partner of the NCAA Tournament. Other ads also show Phil misunderstanding various things, from the purpose of his job as a color commentator to the meaning of a player who got a rebound, of downtown, and more.